Yes you heard that right it is the beginning of a new era. Honda Amaze has brought in a new era along with it. An era where every brand will now offer best featured and hi-tech sedans at competitive prices. It is a beginning because Indian market will be viewing any such scenario for the first time. 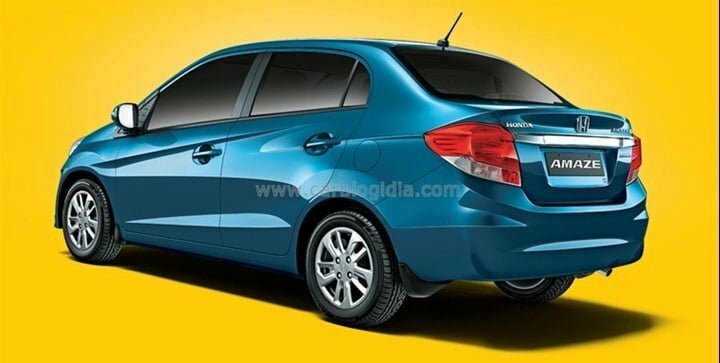 This article hereby presents a close scrutiny of Honda Amaze with one of its close competitors Toyota Etios. Toyota chose the most right timing for introducing its Etios and Etios Liva series just a month before the launch of Honda Amaze. And if you see closely it has given its sedan all the features in close sync with Honda Amaze, Etios especially in all aspects stands as a firm rival with Honda Amaze. 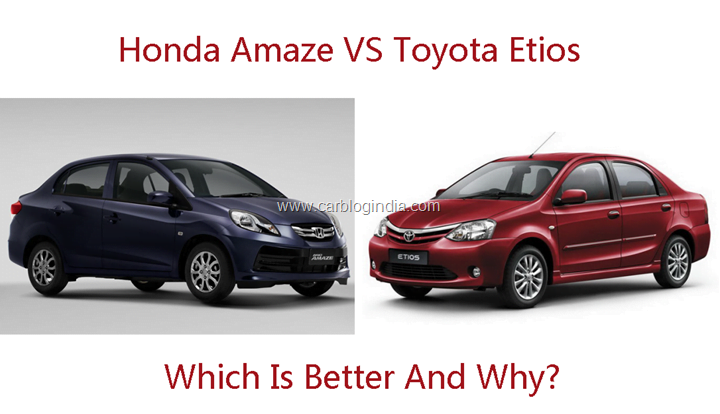 Lets get started with an expert comparison of Honda Amaze VS Toyota Etios. The exterior design that Honda has bestowed Amaze with is based on Brio and represents the signature mark of the Japanese car maker. The front design of the sedan is no doubt very appealing and the finishing given to the front bonnet and fender prove the fact that Amaze hasn’t been designed as a sporty vehicle. The twin slat chrome plated grille gives the car a mature appearance as compared to Toyota Etios. The exteriors appearance of the car no doubt gives it a perfect look of a compact sedan that lacks in several contemporary models in the same segment. Toyota Etios on the other hand bears quite unique and elegant designing. In comparison to Amaze it looks a bit plain but the appeal doesn’t lacks in any manner. The systematic use of chrome over its grille and other parts looks quite pleasing. The rear portion is unique and the tail lights and rest of the features have been designed neatly. Toyota has really built it well along with all standard features. But when both the vehicles are compared Honda Amaze gets an edge over Toyota Etios. The interior front of Honda Amaze has dual interiors along with other standard Honda features. The center console has been given a smart touch and features an air conditioner, music system, and other controls. The powerful steering has mounted audio controls. The driver seat is height adjustable and the best thing about this sedan is that despite being a sub four meter vehicle its front as well as rear seats offer plenty of legroom and head room. The seats have been carved well and provide a firm and comfortable back support to passengers. And despite offering so much space on seaters’ part the boot doesn’t look compromised at all. Honda has presented Amaze with a boot space of 400 liters that caters your space needs in the most optimized manner. 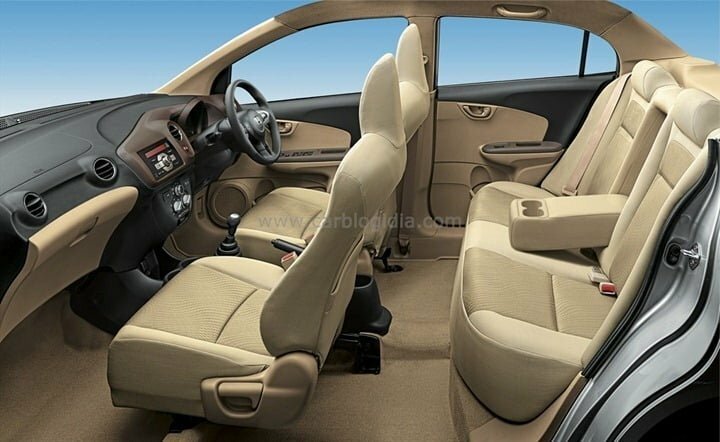 Toyota Etios, on the contrary, has given all latest hi-tech features to its entry level sedan. The interiors have been given a dual shade in red and black color. The cabin spacious and offer comfortable seats. Other included features are power windows, electronically powered steering with mounted audio controls, glove box, DVD/MP3 player, height adjustable driver seat, and a MID in instrument panel. In terms of boot space Toyota Etios earns more points than Honda Amaze by providing a space of 595 liters. So in terms of interiors both sedans earn equal points. Honda Amaze is being offered in both diesel as well as petrol version. And same is the case with Toyota Etios. The diesel version of Honda Amaze bears a 1.5 liter 4 cylinder, iDTEC, DOHC power mill. This engine displaces 1498 cc of fuel and churns our power of 100 PS at 3600 RPM. The torque of this engine stands at 200 NM for 1750 RPM. The diesel version of Etios, on the other hand, is a 1364 cc, 8V, SOHC, four cylinder power mill that produces power worth 68 PS at 3800 RPM. This engine carries a capability to produce torque worth 170 Nm at 1800 – 2400 RPM. The petrol version of Honda Amaze bears a 1.2 Liter SOHC i-VTEC 4-cylinder engine that displaces 1198 cc. The power generated by this engine equals to 88 PS at 6000 RPM against a torque of 109 Nm at 4500 RPM. The petrol version of Toyota Etios bears a 2NR-FE, 4 Cylinder 16V, DOHC petrol engine that can smoke out power worth 90 PS at 5600 RPM against a peak torque of 132 Nm at 3000 RPM. This engine has been equipped with a dual camshaft and four valves on each cylinder that promise maximum power and torque. So here again in terms of power Honda Amaze and Toyota Etios stand neck to neck. Honda Amaze brings along with a good handling package. It has been presented with a pretty efficient braking system that is complete co-ordination with Indian roads and provide complete control over the car during emergency braking and slippery roads. The suspension system provided to the car has also been designed for Indian roads and absorbs all bumps and shocks on rough and uneven paths. The steering of the car is quite light in weight which maker car maneuvering an easy task. Other included features that make ride smooth and safe are EBD, fog lamps, keyless entry, central locking, ABS, and engine immobilizer. The high-end version of the car has been bestowed with SRS airbags pair for front seats. The suspension setup of Toyota Etios is well tuned and promises excellent handling and driving convenience. The car drive proves very well that the systems of the car have been customized to suit Indian road conditions. The passenger comfort is maintained all the times during the rides as the suspension system has been tuned well to absorb all shocks and bumps during the ride. Other included safety features are EBD, ABS, traction control, door ajar warning, , driver seat belt, engine immobilizer, and keyless entry. In this aspect too both the sedans score equal points. Honda Amaze at present is being called as the most fuel efficient car of India. The diesel version of Honda Amaze delivers a mileage of 25.8 KMPL while the petrol version of this car delivers mileage of 18 KMPL of mileage. The Toyota Etios petrol version delivers a mileage 17.6 KMPL while the diesel version gives a mileage of 20 KMPL. Clearly, Honda Amaze is a clear winner. The most amazing and dominating feature that Honda has given to Amaze is its price. This is one point where this car earns all scores from all its competitors including Toyota Etios. The petrol version as well as the diesel version of Honda Amaze has been priced at the lowest staring prices that any sedan in India ever had. The petrol version prices have been quoted in the range of Rs.4.99 – Rs.7.50 which includes six different Amaze variants. There are four diesel variants of Amaze that are at present available in market in the price range of Rs.5.99 lakhs to Rs.7.60 lakhs. Toyota Etios on the other hand stands a bit behind Honda Amaze in this sense. The price range for the petrol version of Toyota Etios has been quoted in the range of Rs.5.45 lakhs – Rs.7.08 lakhs and this range includes five different variants of Toyota Etios. The diesel version price range on the other hand is Rs.6.70 lakhs – Rs.8.15 lakhs. 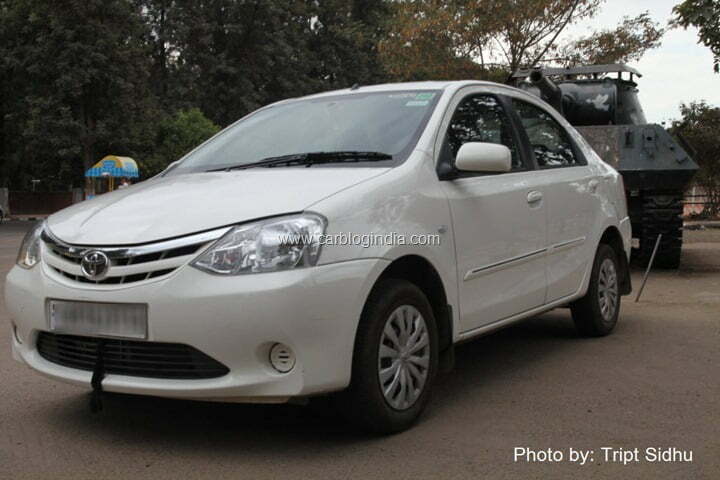 5 variants of diesel version of Toyota Etios are included in this version. Honda has won over the market being the most fuel efficient and cheapest sedan in Indian market. The finishing and other features of the car have also been given an A-class refining. Toyota Etios on the other hand is a piece of art in itself. Toyota has given it best features but in terms of price and mileage it will have to work in order to come in level with Honda Amaze.